The development of ultimate microcavity lasers requires precise engineering of the gain medium. Of particular interest are microlasers based on discrete gain centers, which are aligned to the field maximum of the cavity mode to maximize the modal gain. Here, we report on micropillar lasers with a gain medium composed of site-controlled quantum dots (SCQDs). Adjusting the size of a buried stressor, we define the number of high-quality SCQDs located at the antinode of the fundamental cavity mode. Our deterministic nanoprocessing platform allows us to tightly control the emission properties of high-β microlasers operating in the few-QD regime. H. Yokoyama, “Physics and device applications of optical microcavities,” Science 256, 66–70 (1992). S. Strauf, K. Hennessy, M. T. Rakher, Y.-S. Choi, A. Badolato, L. C. Andreani, E. L. Hu, P. M. Petroff, and D. Bouwmeester, “Self-tuned quantum dot gain in photonic crystal lasers,” Phys. Rev. Lett. 96, 127404 (2006). T. Wang, G. P. Puccioni, and G. L. Lippi, “Dynamical buildup of lasing in mesoscale devices,” Sci. Rep. 5, 15858 (2015). W. W. Chow, F. Jahnke, and C. Gies, “Emission properties of nanolasers during the transition to lasing,” Light. Sci. Appl. 3, e201 (2014). F. Jahnke, C. Gies, M. Aßmann, M. Bayer, H. A. M. Leymann, A. Foerster, J. Wiersig, C. Schneider, M. Kamp, and S. Höfling, “Giant photon bunching, superradiant pulse emission and excitation trapping in quantum-dot nanolasers,” Nat. Commun. 7, 11540 (2016). S. H. Pan, Q. Gu, A. El Amili, F. Vallini, and Y. Fainman, “Dynamic hysteresis in a coherent high-beta nanolaser,” Optica 3, 1260–1265 (2016). S. Kreinberg, T. Grbešić, M. Strauß, A. Carmele, M. Emmerling, C. Schneider, S. Höfling, X. Porte, and S. Reitzenstein, “Quantum-optical spectroscopy of a two-level system using an electrically driven micropillar laser as a resonant excitation source,” Light Sci. Appl. 7, 41 (2018). Z. G. Xie, S. Götzinger, W. Fang, H. Cao, and G. S. Solomon, “Influence of a single quantum dot state on the characteristics of a microdisk laser,” Phys. Rev. Lett. 98, 117401 (2007). S. Reitzenstein, C. Böckler, A. Bazhenov, A. Gorbunov, A. Löffler, M. Kamp, V. D. Kulakovskii, and A. Forchel, “Single quantum dot controlled lasing effects in high-Q micropillar cavities,” Opt. Express 16, 4848–4857 (2008). M. Nomura, N. Kumagai, S. Iwamoto, Y. Ota, and Y. Arakawa, “Laser oscillation in a strongly coupled single-quantum-dot-nanocavity system,” Nat. Phys. 6, 279–283 (2010). S. Kreinberg, W. W. Chow, J. Wolters, C. Schneider, C. Gies, F. Jahnke, S. Höfling, M. Kamp, and S. Reitzenstein, “Emission from quantum-dot high-beta microcavities: transition from spontaneous emission to lasing and the effects of superradiant emitter coupling,” Light: Sci. Appl. 6, e17030 (2017). M. Khajavikhan, A. Simic, M. Katz, J. H. Lee, B. Slutsky, A. Mizrahi, V. Lomakin, and Y. Fainman, “Thresholdless nanoscale coaxial lasers,” Nature 482, 204–207 (2012). I. Prieto, J. M. Llorens, L. E. Muñoz-Camúñez, A. G. Taboada, J. Canet-Ferrer, J. M. Ripalda, C. Robles, G. Muñoz-Matutano, J. P. Martínez-Pastor, and P. A. Postigo, “Near thresholdless laser operation at room temperature,” Optica 2, 66–69 (2015). Y. Ota, M. Kakuda, K. Watanabe, S. Iwamoto, and Y. Arakawa, “Thresholdless quantum dot nanolaser,” Opt. Express 25, 19981–19994 (2017). J. Johansen, S. Stobbe, I. S. Nikolaev, T. Lund-Hansen, P. T. Kristensen, J. M. Hvam, W. L. Vos, and P. Lodahl, “Size dependence of the wavefunction of self-assembled InAs quantum dots from time-resolved optical measurements,” Phys. Rev. B 77, 073303 (2008). M. Gschrey, A. Thoma, P. Schnauber, M. Seifried, R. Schmidt, B. Wohlfeil, L. Krüger, J.-H. Schulze, T. Heindel, S. Burger, F. Schmidt, A. Strittmatter, S. Rodt, and S. Reitzenstein, “Highly indistinguishable photons from deterministic quantum-dot microlenses utilizing three-dimensional in situ electron-beam lithography,” Nat. Commun. 6, 7662 (2015). N. Somaschi, V. Giesz, L. de Santis, J. C. Loredo, M. P. Almeida, G. Hornecker, S. L. Portalupi, T. Grange, C. Antón, J. Demory, C. Gómez, I. Sagnes, N. D. Lanzillotti-Kimura, A. Lemaítre, A. Auffeves, A. G. White, L. Lanco, and P. Senellart, “Near-optimal single-photon sources in the solid state,” Nat. Photonics 10, 340–345 (2016). S. Unsleber, Y.-M. He, S. Gerhardt, S. Maier, C.-Y. Lu, J.-W. Pan, N. Gregersen, M. Kamp, C. Schneider, and S. Höfling, “Highly indistinguishable on-demand resonance fluorescence photons from a deterministic quantum dot micropillar device with 74% extraction efficiency,” Opt. Express 24, 8539–8546 (2016). M. Davanco, J. Liu, L. Sapienza, C.-Z. Zhang, J. V. De Miranda Cardoso, V. Verma, R. Mirin, S. W. Nam, L. Liu, and K. Srinivasan, “Heterogeneous integration for on-chip quantum photonic circuits with single quantum dot devices,” Nat. Commun. 8, 889 (2017). A. Dousse, L. Lanco, J. Suffczyński, E. Semenova, A. Miard, A. Lemaître, I. Sagnes, C. Roblin, J. Bloch, and P. Senellart, “Controlled light-matter coupling for a single quantum dot embedded in a pillar microcavity using far-field optical lithography,” Phys. Rev. Lett. 101, 267404 (2008). C. Schneider, T. Heindel, A. Huggenberger, P. Weinmann, C. Kistner, M. Kamp, S. Reitzenstein, S. Höfling, and A. Forchel, “Single photon emission from a site-controlled quantum dot-micropillar cavity system,” Appl. Phys. Lett. 94, 111111 (2009). T. Sünner, C. Schneider, M. Strauß, A. Huggenberger, D. Wiener, S. Höfling, M. Kamp, and A. Forchel, “Scalable fabrication of optical resonators with embedded site-controlled quantum dots,” Opt. Lett. 33, 1759–1761 (2008). J. Tatebayashi, S. Kako, J. Ho, Y. Ota, S. Iwamoto, and Y. Arakawa, “Room-temperature lasing in a single nanowire with quantum dots,” Nat. 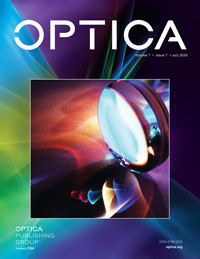 Photonics 9, 501–505 (2015). A. Strittmatter, A. Holzbecher, A. Schliwa, J.-H. Schulze, D. Quandt, T. D. Germann, A. Dreismann, O. Hitzemann, E. Stock, I. A. Ostapenko, S. Rodt, W. Unrau, U. W. Pohl, A. Hoffmann, D. Bimberg, and V. Haisler, “Site-controlled quantum dot growth on buried oxide stressor layers,” Phys. Status Solidi A 209, 2411–2420 (2012). M. Strauß, A. Kaganskiy, R. Voigt, P. Schnauber, J.-H. Schulze, S. Rodt, A. Strittmatter, and S. Reitzenstein, “Resonance fluorescence of a site-controlled quantum dot realized by the buried-stressor growth technique,” Appl. Phys. Lett. 110, 111101 (2017). A. Kaganskiy, S. Fischbach, A. Strittmatter, S. Rodt, T. Heindel, and S. Reitzenstein, “Enhancing the photon-extraction efficiency of site-controlled quantum dots by deterministically fabricated microlenses,” Opt. Commun. 413, 162–166 (2018). A. Kaganskiy, F. Gericke, T. Heuser, T. Heindel, X. Porte, and S. Reitzenstein, “Micropillars with a controlled number of site-controlled quantum dots,” Appl. Phys. Lett. 112, 071101 (2018). W. Unrau, D. Quandt, J.-H. Schulze, T. Heindel, T. D. Germann, O. Hitzemann, A. Strittmatter, S. Reitzenstein, U. W. Pohl, and D. Bimberg, “Electrically driven single photon source based on a site-controlled quantum dot with self-aligned current injection,” Appl. Phys. Lett. 101, 211119 (2012). A. Surrente, P. Gallo, M. Felici, B. Dwir, A. Rudra, and E. Kapon, “Dense arrays of ordered pyramidal quantum dots with narrow linewidth photoluminescence spectra,” Nanotechnology 20, 415205 (2009). A. Mohan, P. Gallo, M. Felici, B. Dwir, A. Rudra, J. Faist, and E. Kapon, “Record-low inhomogeneous broadening of site-controlled quantum dots for nanophotonics,” Small 6, 1268–1272 (2010). A. Huggenberger, S. Heckelmann, C. Schneider, S. Höfling, S. Reitzenstein, L. Worschech, M. Kamp, and A. Forchel, “Narrow spectral linewidth from single site-controlled InGaAs quantum dots with high uniformity,” Appl. Phys. Lett. 98, 131104 (2011). S. Reitzenstein, C. Hofmann, A. Gorbunov, M. Strauß, S. H. Kwon, C. Schneider, A. Löffler, S. Höfling, M. Kamp, and A. Forchel, “AlAs/GaAs micropillar cavities with quality factors exceeding 150.000,” Appl. Phys. Lett. 90, 251109 (2007). G. Björk, A. Karlsson, and Y. Yamamoto, “Definition of a laser threshold,” Phys. Rev. A 50, 1675–1680 (1994). M. D. Sturge, “Optical absorption of gallium arsenide between 0.6 and 2.75 ev,” Phys. Rev. 127, 768–773 (1962). S. Strauf and F. Jahnke, “Single quantum dot nanolaser,” Laser Photon. Rev. 5, 607–633 (2011). A. Larsson, “Advances in VCSELs for communication and sensing,” IEEE J. Sel. Top. Quantum Electron. 17, 1552–1567 (2011). M. Florian, P. Gartner, C. Gies, and F. Jahnke, “Phonon-mediated off-resonant coupling effects in semiconductor quantum-dot lasers,” New J. Phys. 15, 035019 (2013). U. Hohenester, A. Laucht, M. Kaniber, N. Hauke, A. Neumann, A. Mohtashami, M. Seliger, M. Bichler, and J. J. Finley, “Phonon-assisted transitions from quantum dot excitons to cavity photons,” Phys. Rev. B 80, 201311 (2009). M. Winger, T. Volz, G. Tarel, S. Portolan, A. Badolato, K. J. Hennessy, E. L. Hu, A. Beveratos, J. Finley, V. Savona, and A. Imamoğlu, “Explanation of photon correlations in the far-off-resonance optical emission from a quantum-dot-cavity system,” Phys. Rev. Lett. 103, 207403 (2009). De Miranda Cardoso, J. V.
Fig. 1. (a) Top side: spectra at low (black trace) and higher (red trace) excitation powers of the micropillar with a diameter of 5.2 μm and an aperture diameter of 1400 nm. Bottom part: derivative (only positive values) of the low-power spectrum. The noise band is marked by a blue line, and identified SCQD lines are marked by red arrows. (b) Number of SCQDs as a function of the aperture diameter of micropillars with a diameter of 5.2 μm. Two excitonic emission lines (i.e., exciton and biexciton) per SCQD are assumed. Insets: schematic illustration of a micropillar structure (top) and scanning electron microscope (SEM) image of a fully fabricated micropillar (bottom). (c) Spectral distribution of the SCQD emission lines for all investigated micropillars. For the sake of clarity, the corresponding aperture diameters are subdivided into three groups: 700–950 nm (black bars), 950–1200 nm (red bars), and 1200–1400 nm (blue bars). Inset: wavelength of the fundamental pillar mode as a function of the aperture diameter. The fundamental mode experiences lower lateral light confinement and red-shifts with increasing aperture diameter . (d) Number of the SCQD emission lines as a function of spectral detuning from the fundamental cavity mode for micropillars with an aperture diameter of 975 nm (pillar 2, blue bars) and 1250 nm (pillar 4, red bars). Fig. 2. (a) Input–output curves of the strong mode and the weak mode of a micropillar with an oxide aperture diameter of 975 nm. The input–output curve of the strong mode is approximated using the rate equations model from . Inset: spectra of both modes taken at a pump power of 5.2 mW. (b) Linewidth of the strong mode and the weak mode as a function of the input power. The spectral resolution limit is indicated with a dashed horizontal line. (c) Excitation power-dependent autocorrelation values g(2)(τ=0) for the strong mode and for the weak mode. Inset: autocorrelation histograms recorded from the strong mode at 5.1 mW (blue, below threshold) and 6.2 mW (black, above threshold), respectively. The corresponding working points are marked with arrows. Black squares and red circles in (a)–(c) correspond to the strong mode and the weak mode, respectively. Fig. 3. (a) Input–output curves, (b) power-dependent emission linewidth, and (c) g(2)(τ=0) for the micropillars 1–4 with respective oxide aperture diameters of 780 nm (black), 975 nm (blue), 1115 nm (olive), and 1250 nm (red). The threshold power for each micropillar is marked with a dashed line of its respective color. Fig. 4. (a) Measured (black triangles) and simulated (blue rhombuses) Q-factor as a function of the aperture diameter. Inset: simulated Q-factor in a wider aperture range. (b) Γ-factor (black squares) and the threshold pump power (red circles) as a function of the aperture diameter. The horizontal dashed line refers to the Γ-factor of a micropillar with a diameter of 5.2 μm randomly distributed QDs with a density of 109/cm2. The vertical dashed line separates the micropillars exhibiting transition to lasing (aperture diameters from 700 nm to 1200 nm) from the non-lasing ones.